How to connect via Remote Desktop Connection (RDC)? 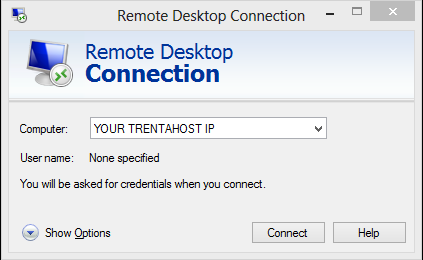 - Knowledgebase - TRENTAHOST INC.
Once, your Windows VPS is active and you have received the details you will want to open up RDC (Remote Desktop Connection. RDC comes pre-installed with any Windows Operating System, just do a search for it. 1.) Locate RDC and open it up by double clicking the icon below. 2.) Once, open enter your IP address, the IP will be listed in the New Account Information email sent by TrentaHost. Once you have typed your IP address press connect. 3.) Now for the username enter in Administrator and the password should also be listed in the email. 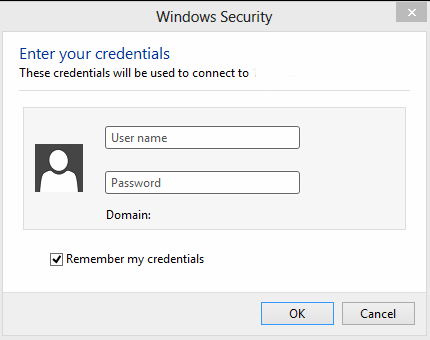 After the username and password have ben entered please check "Remember My Credentials" and press "Ok". 4.) That it, the VPs should now load. If you see a screen with a blue background then you have done the steps successfully. ENJOY!